Mid-Continent Group, LLC (MCG) is a Native American, Service-Disabled Veteran-Owned Small Business located in Oklahoma City, Oklahoma. We are a small group of diverse backgrounds that make up a mechanical contractor who excels at the work no one else wants to tackle. From complex specialty alloy welding to innovative modular fabrication, we thrive on it all. MCG is committed to safety and has a constant focus on keeping an industry leading Experience Modification Rate (EMR). Our team has completed design, fabrication, installation and commissioning on projects in nearly every state so if you have a need, we would love to hear about it. We strive to create a system that has optimal performance characteristics to save energy and money over the life-cycle of the facility while understanding that there are various ways to meet those objectives. Mid-Con Group is capable of producing LOD400 BIM designs using Autodesk Revit MEP and Fabrication CADmep software from concept through completion. Our brand new 20,000 square foot fabrication facility is ready to maximize efficiency of any project by constructing as much as possible in our controlled environment. Whether it be piping systems, skids, or entire modular facilities we believe strongly in our ability to reduce cost and project risk by implementing creative fabrication strategies. 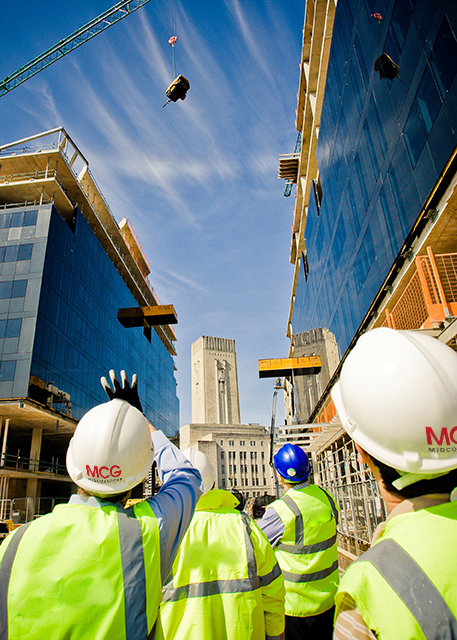 MCG has a focus on limiting job-site labor. Therefore, we aim to construct the project with as few people on-site as possible to reduce congestion, safety risk, schedule compression, and ultimately cost. When we do come on-site, we utilize only highly-skilled, highly-efficient United Association plumbers, pipe fitters, and welders to meet any budget and any schedule. We believe that preventative maintenance is the best way to ensure your equipment and facility are operating at their peak levels for their entire life. However, we understand that budgets do not always allow for that. Our service technicians are trained and equipped to handle nearly every service-related issue that can arise, regardless of the type of mechanical system or equipment being serviced. © 2018 Mid-Continent Group is proudly powered by Mid-Continent Group, LLC.